NOW OPEN! Carolina Square is a vibrant mixed-use brand-new luxury apartment community in Chapel Hill, NC. 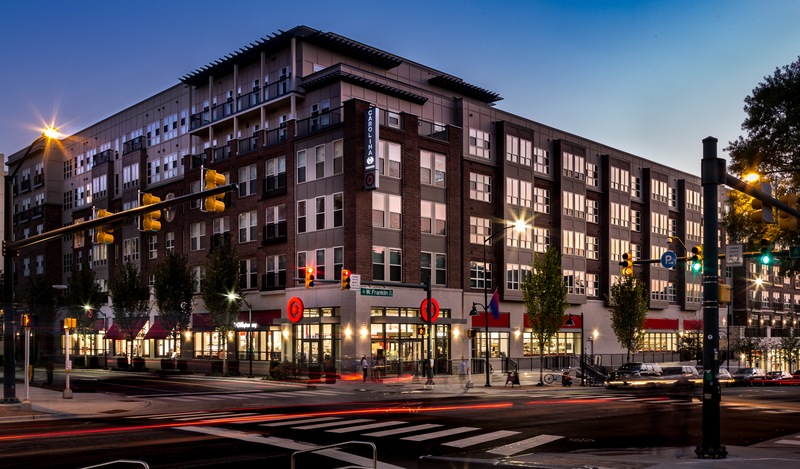 The apartments at Carolina Square are part of a larger mixed-use project that adds new office, an urban Target store and luxury apartment homes to the vibrant Franklin Street in Downtown Chapel Hill! With an easy walk to over 60 great restaurants and bars, Carolina Square has the PERFECT location. Offering 246 apartments with high-end finishes and amenities like solid surface countertops, tiled backsplashes, upgraded cabinets and lighting and plank flooring mean comfort and convenience come first. The 3 buildings of retail, office and apartments are designed around a center courtyard with direct access to Franklin Street. Additional amenities include a saltwater pool, large fitness center, top floor business center, elevated courtyards, outdoor kitchens, pet grooming center, resident great rooms, gaming centers and more. Experience all that Chapel Hill has to offer at Carolina Square, a Northwood Ravin signature community.